Activists dismiss 'grossly inaccurate' statement by Kerry, point to significant support by black South Africans for Israel. 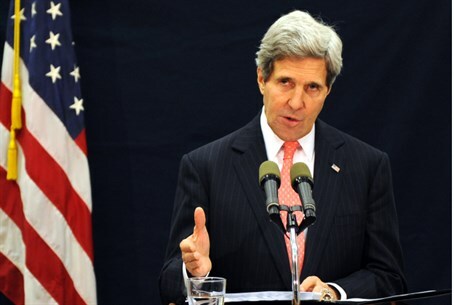 Activists at a special Arutz Sheva event in Manhattan refuted accusations made Monday by US Secretary of State John Kerry, in which he claimed that Israel could soon become an "apartheid state" in the absence of an agreement with the Palestinian Authority. Baruch Gordon of Israel Empowered pointed out that Kerry’s words were "a gross inaccuracy and an affront not only to Israeli democracy, but more so to the blacks of South Africa." Gordon pointed to support for Israel from prominent black South Africans such as member of parliament and founder of the African Christian Democratic Party (ACDP), Reverend Kenneth Meshoe. Moshoe's vocal support is "the single, strongest, most compelling and convincing response to Kerry’s remarks," as he "explains that comparing Israel to Apartheid betrays the memory of those blacks who suffered real apartheid." Gordon further argued that even those who limit the apartheid accusation to Israel’s policies in Judea and Samaria (the West Bank), are wholly mistaken. Arabs of Judea and Samaria, he pointed out, vote in elections for the Palestinian Authority which administers all of their civil affairs. Furthermore, every day, many Palestinian Arabs are admitted to Israel’s hospitals and are treated in the same rooms and facilities as Jewish and Arab Israel citizens. In addition, they are able to move freely between Palestinian Authority-controlled areas. Blacks in South Africa had none of these privileges, he noted.